1,400 employees worldwide contribute their passion and expertise to Weber products. Weber consistently relies on in-house manufacturing and produces many components itself. Weber provides advice and support, and offers comprehensive after-sales service. Christmas and presents simply belong together. But instead of Christmas presents, the management of Weber Maschinenbau decided to support The UN Children’s Fund UNICEF e.V. with the money instead. Congratulating staff on their tenure of 25 or ten years in Breidenbach, board of Weber invites honorees to special anniversary event in Biedenkopf. Last week, the children of "Maia", the Protestant children's and family house in Breidenbach, visited the Weber Maschinenbau headquarters. They came to support the Weber team in a particularly important task at this time of year: decorating the Christmas tree in the company’s foyer. Unique forum of expert lectures, industry dialogue and live presentations showcases line solutions for efficient processing of bacon and ham. A precise cutting result is the top priority when slicing: That is exactly what is achieved when using Weber's high-performance slicer. With up to 2,000 slices per minute and an optimal product yield and minimal giveaway, Weber slicers fulfil all requirements in food processing companies – from artisanal to industrial companies. The open construction in Weber Hygienic Design make cleaning and maintaining Weber slicers easy and efficient. Derinding, removing fat and skin membrane – Weber skinners are used worldwide every day and are known for their reliability. They are also highly durable, in continuous operation – even in industrial two or three-shift production. Weber skinners deliver clean results and meet the highest hygienic standards with their automatic cleaning system and their high-grade stainless steel product qualities. As they are so sturdy, Weber skinners rarely require servicing, which minimizes additional costs. Weber food robots solve complex problems and implement a wide range of product manufacturing methods: Gripping individual or multiple slices and precision positioning in packages or trays are just a few examples of possible applications. 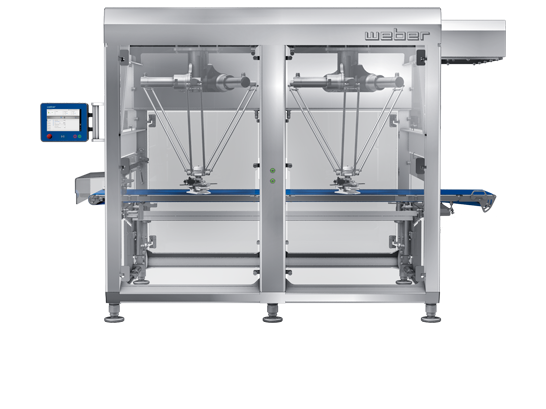 Weber food robots eliminate virtually all contact with the products, improving food safety and reducing costs. Their flexible and open design also makes Weber food robots easy to clean. In addition to highest performance requirements, modern slicers must comply with or even exceed today's hygienic regulations – the top priority for food processing. Open designs, reduced cavities, slimmer housings and short cleaning processes of the especially easy-care stainless steel components guarantee high availability and greater efficiency. High percentage of in-house components "made in Germany"
"Only companies that produce as much as possible themselves within their own supervision and responsibility can really guarantee quality." In accordance with this vision of founder Günther Weber, all stainless steel elements, right down to hygienic screws are produced in-house – our key to maximum flexibility in the interest of our customers. Weber customers in food processing industries must adapt their ranges to the latest trends all the time and must be able to react flexibly. We support them with holistic solutions and offer powerful added value in production. Maximum yield with minimum giveaway – that is how we ensure maximum profitability. The international food industry has long valued the strength of Weber products. As a systems provider, our after-sales service and the Weber Academy range of training courses always focus on the right individual solutions – now even more efficiently thanks to Weber Consult. 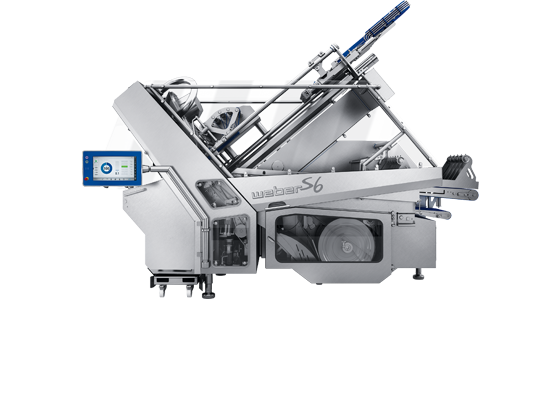 Weber Maschinenbau has been producing pioneering systems for processing and finishing lunch meat, meat, cheese and other foods for over 35 years. The Weber Group, with its headquarters in Breidenbach, Hesse and 25 locations in 21 countries, has a unique, highly diverse range. Many satisfied customers around the world swear by this combination of quality and expertise.